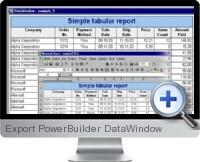 Export PowerBuilder DataWindow for Excel is a PowerBuilder library designed for exporting data from DataWindow and DataStore formats in PowerBuilder to Excel spreadsheets with cell formatting intact. Supports Free form, Grid, Tabular, N-UP, Group, Composite, Nested and Crosstab styles in PowerBuilder. Supports Text, Column, and Expression types of DataWindow objects. Supports DropDownDW, DropDownListBox, Edit, Edit with Code Table and EditMask edit styles of fields within PowerBuilder. Converts sets of DataWindows and DataStores to separate worksheets of an Excel workbook. Supports of all data types. Supports and maintains of all kinds of text and data formatting. Simple, intuitive, and easy-to-use program interface. Write information into cells and worksheets. Format cells and worksheets within the Excel workbook.